I’ve been told I have a unique process. I expect that with the growing number of painters simply tracing, gridding, projecting or even copying photos verbatim my process is unique (don’t even get me started on art ethics). Much of my process is inspired by that of great painters of the past. I begin with a sketches from my mind until I’m completely satisfied with the composition. Then I copy the sketch to the canvas. This ensures that I maintain the exact composition that I planned. Then I Begin to bring in the models. 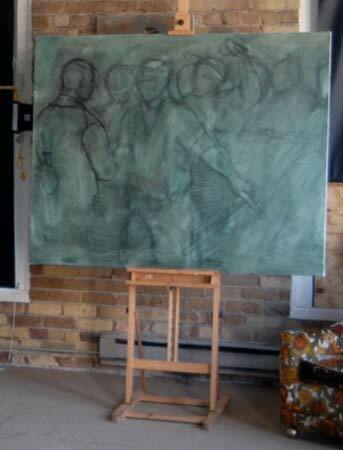 One at a time, I carefully pose each model to the exact pose of the imaginary figure lightly sketched on the canvas. I carefully draw each model directly on top of their corresponding sketch. In the photo you can see I’ve begun to draw the first model in at the left of the canvas. After each model is drawn in I will begin to add color. That process I will talk about when I have a painting to show you.